Circularity (Roundness): A condition where all points of a surface of revolution (sự xoay vòng), at any section perpendicular to a common axis, are equidistant (ở một khoảng cách bằng nhau (từ hai hoặc nhiều địa điểm...)) from that axis. The condition of circularity is not limited to cylinders and spheres. MMC or LMC is not applicable. For a feature other than a sphere, all points of the surface intersected by any plane perpendicular to an axis or spine (curved line / a simple, none -self-intersecting / curve) are equidistant from that axis or spine (xương sống, cạnh sắc). For a sphere (hình cầu), all points of the surface intersected by any plane passing through a common center are equidistant from that center. Roundness: Is the measure of how closely the shape of an object approaches that of a mathematically perfect circle. 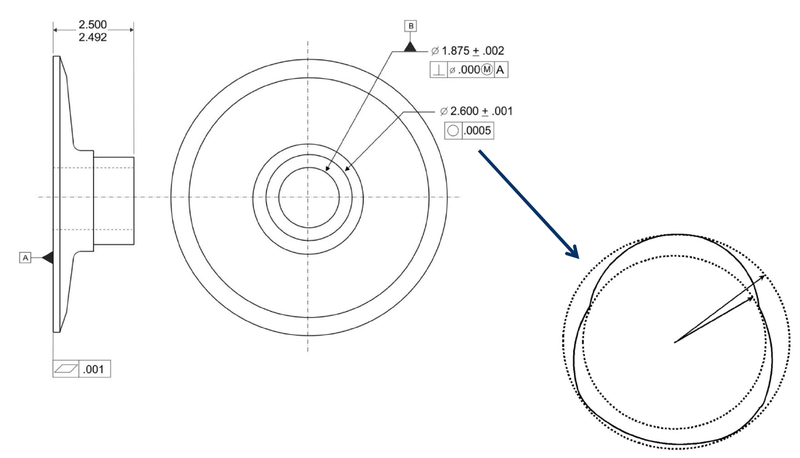 Roundness applies in two dimensions, such as the cross sectional circles along a cylindrical object such as a shaft or a cylindrical roller for a bearing. Roundness is a radial measurement, not diameter. 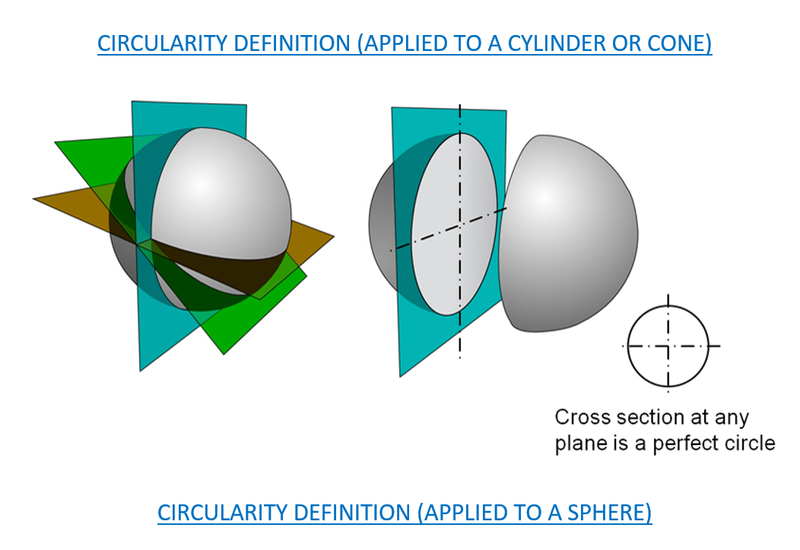 The difference between circularity and roundness: Circularity is a 2-Dimensional tolerance that controls the overall form of a circle ensuring it is not too oblong, square, or out of round. Roundness is independent of any datum feature and only is always less than the diameter dimensional tolerance of the part. Circularity is the 2D version of cylindricity. 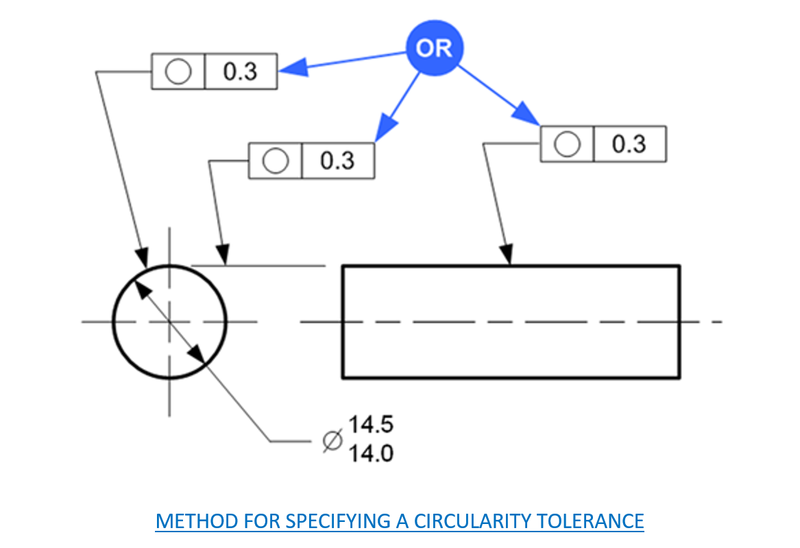 While cylindricity ensures all the points on a cylinder fall into a tolerance, circularity only is concerned with individual measurements around the surface in one circle. With a stack of coins, circularity would be a measurement around one coin while cylindricity would have to measure the entire stack. (cylindricity is actually a combination of circularity and straightness). 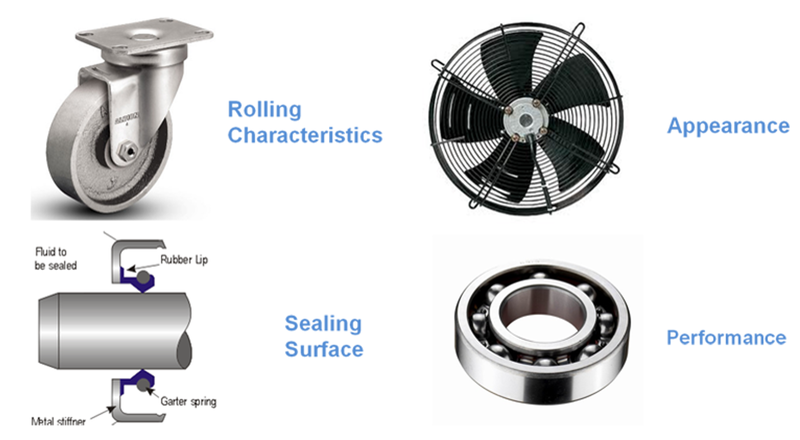 Applications used circularity tolerance: A real-world application of a circularity tolerance is to limit circularity deviations on a shaft for a seal (đóng kín, bịt kín, gắn xi) or rolling characteristics. 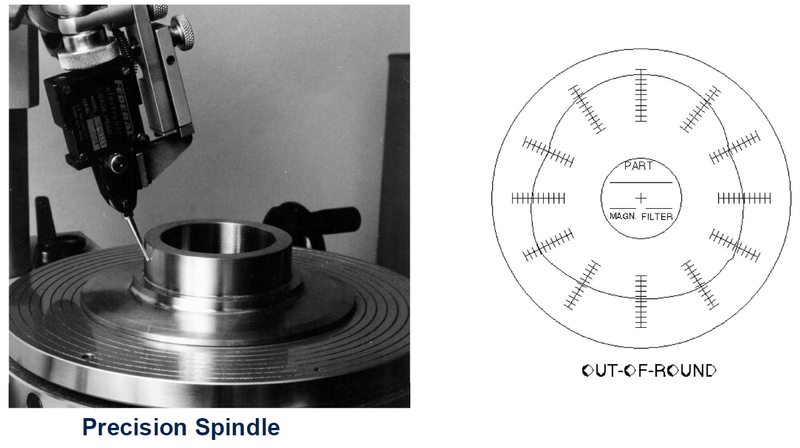 Any time a part needs to be perfectly round such as a rotating shaft, or a bearing, circularity is usually called out. Ex: A hole and a rotating shaft, both parts should be circular and have a tight tolerance. 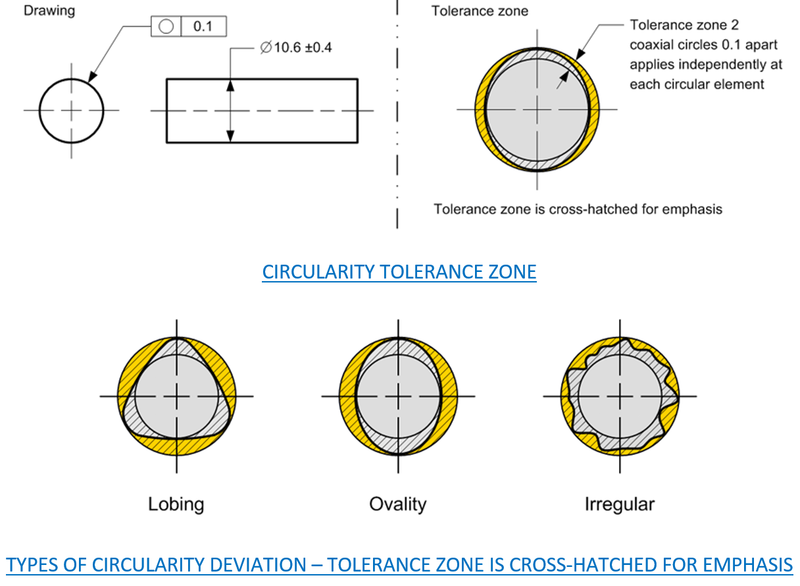 Circular Tolerance: A geometric tolerance that specifies a tolerance zone bounded by two concentric circles within which each circular element of the surface must lie. Circular Tolerance Zone: Two concentric circles, one inner and one outer, in which all the points within the circular surface must fall into. The tolerance zone lies on a plane that is perpendicular to the central axis of the circular feature. The tolerance zone for a circularity tolerance is the circularity tolerance value. Lobbing (vòng cầu, câu, rót) is limited by a circularity tolerance zone. 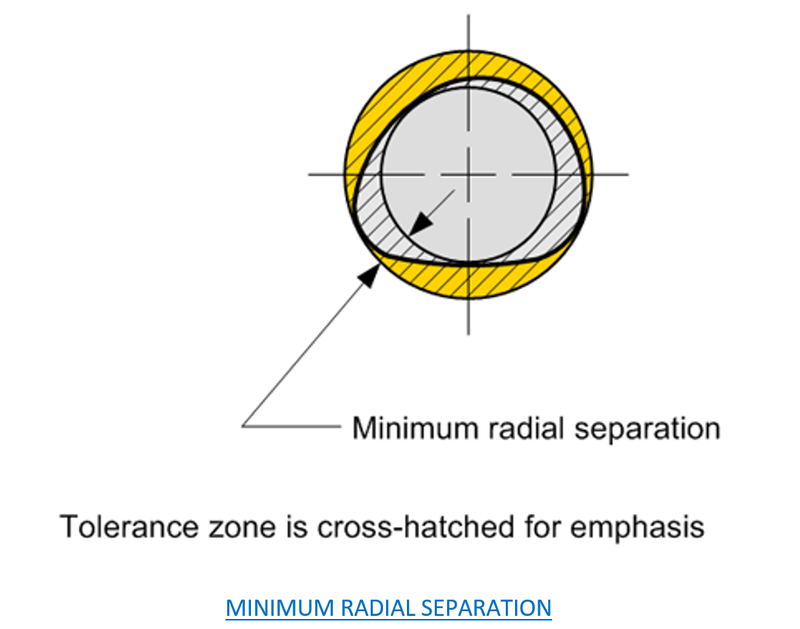 Roundness tolerance zone is two concentric circles. How rule #1 effect on circularity tolerance. 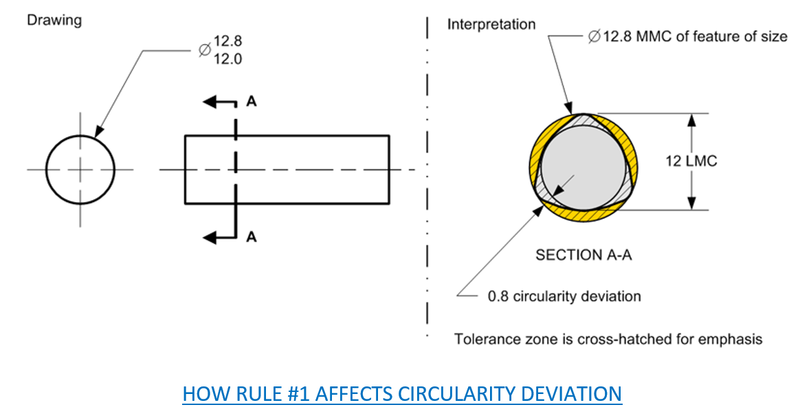 When Rule #1 applies to a cylindrical feature of size, the circularity deviations are limited to the same values as the size tolerance. How to specify a circular tolerance. 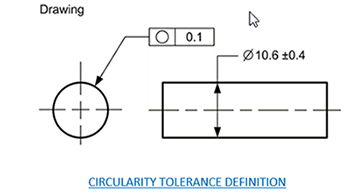 A circularity tolerance feature control frame should not be placed beneath the size dimension of the diameter. 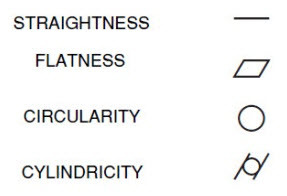 Interpret a circularity tolerance applied to a cylindrical surface elements. 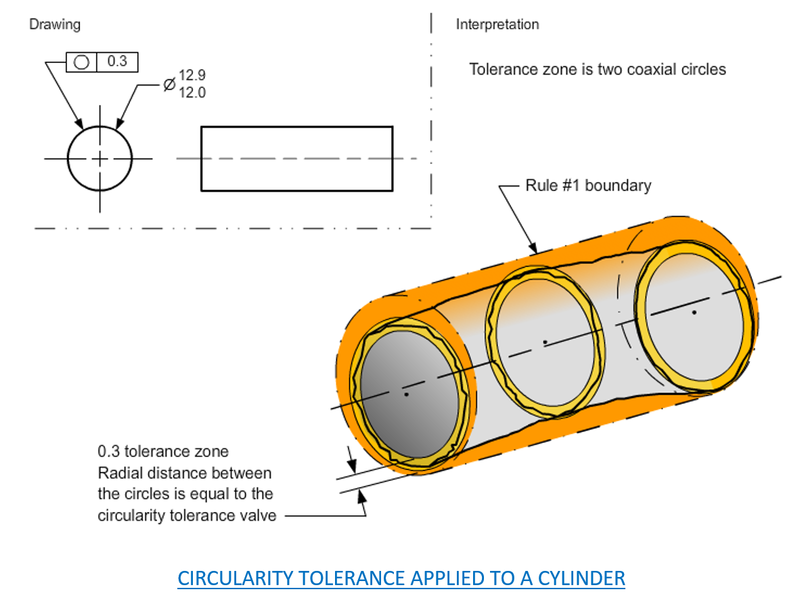 When a circularity tolerance is applied to a cylindrical surface, the tolerance zone applies at multiples places along the full length of the tolerance feature. Since a circularity tolerance is not related to any datum’s, care must be taken so that the inspection method is not affected by any location or orientation. When verifying a circularity tolerance, a set of points are taken about an axis, spine, or center point. 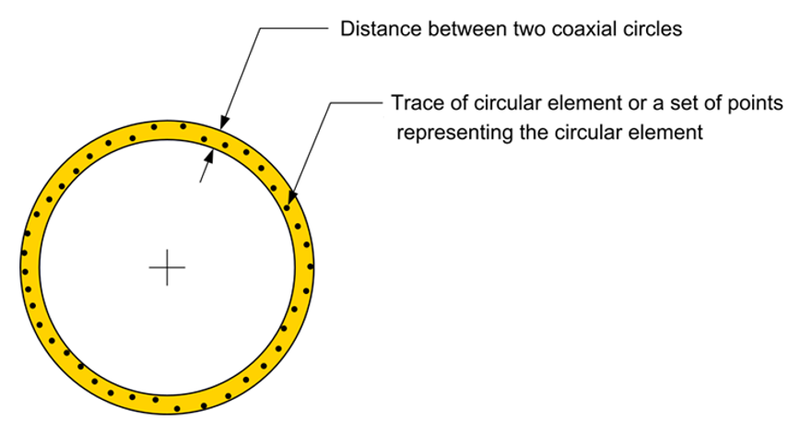 The value of the minimum radial separation between coaxial circle containing the points is identified. Minimum radial separation is the radial distance between two concentric circles that just contain the measured circular trace (or set of points) at a minimum. How to verify a circular tolerance? 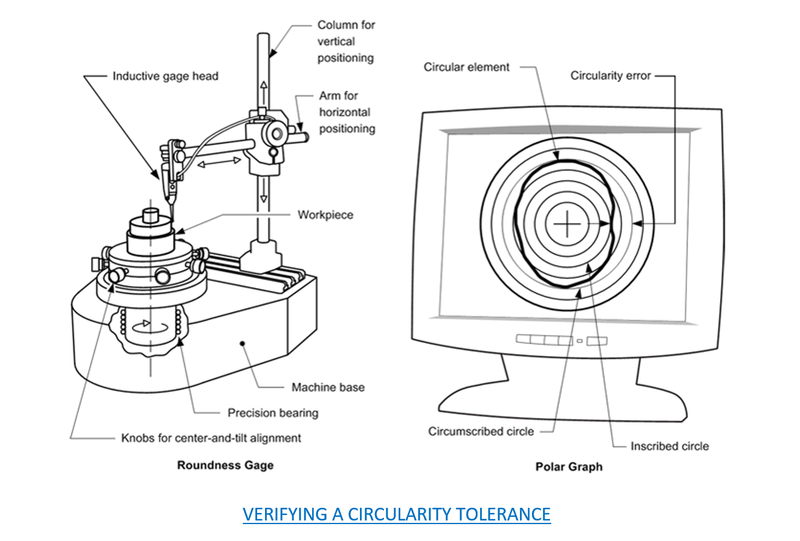 A common inspection tool for inspecting a circularity tolerance is a roundness gage. How to measure roundness? To measure any component for roundness we require some form of datum. 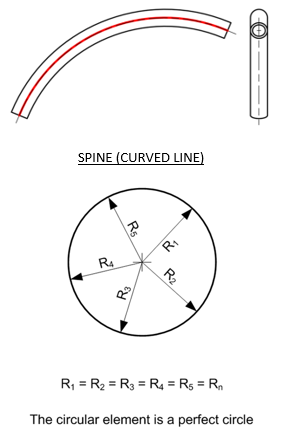 Roundness is usually assessed by rotational techniques by measuring radial deviations from a rotating datum axis, this axis remains fixed and becomes the main reference for all measurements.